Deftly weaving her own personal experiences with her sister’s incarceration alongside the stories of prisoners who she has been writing to over the last eight years, Schenwar illustrates the devastating effects of prisons on those who are incarcerated, their families, and our communities. With her book, she not only offers a searing analysis of the prison industrial complex but also possibilities for creating alternatives to mass incarceration. ...Maya’s book, filled with the voices of her incarcerated pen pals—one of whom is Maya’s own beloved sister, Kayla. Woven together with her family’s experience facing the formidable hurdles likewise faced by millions as they try to remain connected to a locked-down loved one, Maya’s analysis of our “prison nation” is that of a system rooted in the dehumanization of people of color, particularly Black people. Her assertion that “prison doesn’t work” does not revolve around wrongful convictions, nor does her challenge that “we can do better” point towards mild reforms. Instead her book demands we wrestle with questions posed by indictments and non-indictments alike. What would truly provide healing and safety for our society? Well-versed in the ins-and-outs of the system, Locked Down, Locked Out offers an accessible, easily readable account of the ways the system dehumanizes prisoners, making reentry into the outside world difficult for many. By merging her sister’s story with a broader, investigative report, Schenwar humanizes those we dub “offenders” and assesses how we, as a society, can do better. Rather than depressing, the book is ultimately an inspiring call to action. I personally have not read the book yet (you gotta see my to-read-book pile, yikes! 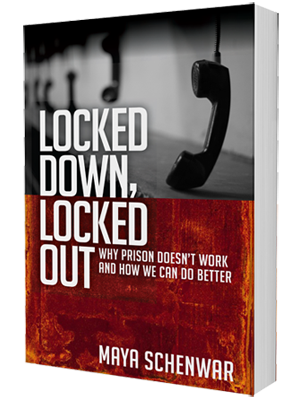 ), but I know Maya and her work enough to know that this book will be an amazing read, especially to those who are currently incarcerated.That is why I was excited to here that the Chicago Women's Book Project has offered to send out copies of Locked Down, Locked Out to people in prison. This will be a demonstration that people on the outside are thinking about and supporting them. Disclaimer: Purchasing from Powells or IndieBound using the links above benefits Viva la Feminista. Feel free to purchase Maya's book from any retailer of your choosing.